Running your contact center operations with a platform like Zendesk is an important step towards embracing the API economy. But if you take this step without moving telephony in the same direction, you’re leaving one foot in the legacy world. That’s not to say that there is no longer any place for legacy systems – a range of business requirements demands a range of responses. 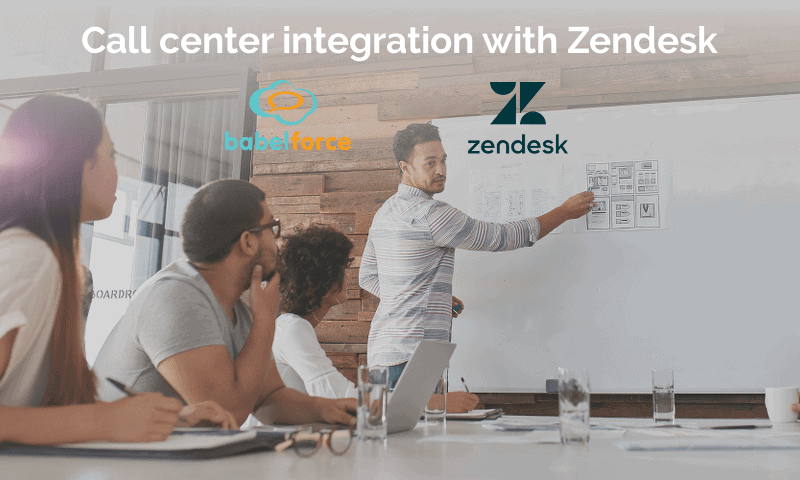 However, with a wide-scale integration of software like Zendesk, it simply makes no sense to ignore the infrastructure needs of multi-site and multi-device contact centers. For a large enterprise to get the most out of Zendesk, they will usually need to tackle a few core parts of their call center deployment. How will your infrastructure handle the data throughput including high quality voice? What benefits can be derived from your existing IVR and telecoms estate? Today we’re going to answer these questions by looking at how you can benefit from the API economy through the babelforce integration with Zendesk. Why does this integration work? Zendesk clients can make use of babelforce simply by installing the babelConnect app – in a matter of minutes you’ll have the combined functionality of both systems with no data migrations and no complex coding. More importantly, they cover complementary areas of client needs. Contact center agents are increasingly expected to be multi-skilled operatives who can meet customer requirements in any channel. The power of Zendesk is its ability to unify multiple channels and creating a single customer view. And with Zendesk guiding your customer relationship building, you can use babelforce to get to grips with the infrastructure that connects it all up with your calls and SMS. Infrastructure is pivotal, especially when it comes to the clarity and reliability of your calls. When you can’t guarantee high quality calls, staff and customer experience will suffer. That’s why our enterprise-grade platform uses over 40 carriers and 300 integrated service providers, enabling high quality and extremely reliable inbound and outbound voice services. This provides a way for clients with Zendesk deployments in multiple sites, or territories, or even continents, to optimize their data and voice calls. We pay particular attention to the quality of our carriers and monitor them carefully, using only the top performers. However far your centers are spread, you can be sure that our telecommunications and network infrastructure delivers the level of service that you demand. Using Zendesk means being confident that all relevant customer information can be viewed by agents. Combine that with babelforce’s deep data integration and you can take this visibility a step further. By streaming real-time data and enabling other applications to subscribe to the feeds, you can ensure that every call event is exposed. Key business applications like CRM, ERP, and BI become integrated business tools and feed data to your Zendesk UI, creating the most personalized customer profile possible, as well as the most detailed reporting. You can configure every aspect of the interaction between babelforce and Zendesk, and build processes based around events and outcomes. The ability to create your own call flows with simple no-code automation means contact centre teams have the option to take a substantial role in process design. Major leaps forward can be made in efficiency through automation, with outbound calls and SMS interactions created directly from tickets. With no action missed, every insight feeds into the systems you depend on. Zendesk is a leader in the industry’s move towards building firm customer relationships, and the detailed analytics that the platform collects can easily be combined with inputs from other applications. The result is a broad view of processes that highlight the most successful aspects of your approach. Based on this, babelforce can help you to change workflows around top-scoring interactions. Large or fast-growing businesses often find themselves with an extremely diverse estate of telecoms solutions, operator contracts, and IVR. It can be pretty challenging to try and offer a consistent and on-brand service with such mixed resources. To make your Zendesk deployment run smoothly across these resources, you need the ability to connect any variation of software and hardware. SIP Softphone, deskphone or VoIP – babelforce will work with any combination. You also need to bring in calls from IVR to the platform with enough contextual information to drive decisions in your new call flows. That means breaking down the silo around IVR by feeding data into and out of related systems. While it’s clear to the industry that IVR helps customers process queries more quickly, customers themselves are still hesitant. This technology makes up over a quarter of total call experience, but only 7% of companies offer IVR with comparable CSat to the live agent experience. Poor design has held the technology back, so improving your IVR presence is a priority. But you can’t do that without studying call event data like abandon rates and operator requests, as well as the pathways that lead to repeat contacts. babelforce puts this level of detail within reach, while allowing enterprises to easily edit pathways and routing criteria. This creates the kind of agility that can remove the obstacles sustaining bad IVR, and bad customer experience in general. The big question hanging over your Zendesk deployment is whether you can handle the transition in a way that takes advantage of the full integration capability – the alternative is to paper over the cracks in your existing mix and stay stuck in a dated legacy setup. Many systems must come together to deploy successfully – so what efforts are you making to integrate those systems through the API economy?